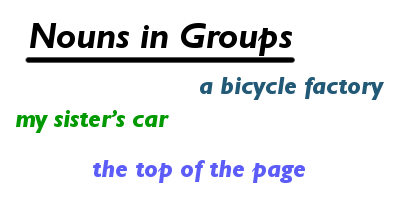 We also prefer the noun + preposition + noun structure with words that refer to units, selections and collections, like piece, slice, lump, bunch, blade, pack, herd, flock, group, and so on (e.g. a piece of paper; a bunch of flowers). Mi inglés es muy pobre, así que no haré grandes alardes. Me gusta la temática de tu blog, porque me parece una herramienta tremendamente útil. I like this website. I think it's a very good idea. My english is quite bad, so that could be the place that I've been waiting for. Thanks a lot. *Sechat*, tu inglés es bastante bueno así que ánimo, practica y ya verás la mejora. Si puedo ayudarte o necesitas algo para el estudio del inglés no dudes en preguntar. No sé si lo sabes pero también hay una versión en español del blog en Aprender Inglés Online. *Sechat*, your English is pretty good so go on; practice and you’ll see the improvement. If I can help you or you need something for studying English please don’t hesitate to ask me. I don’t know if you know it but there is also a Spanish version of the blog in Aprender Inglés Online.